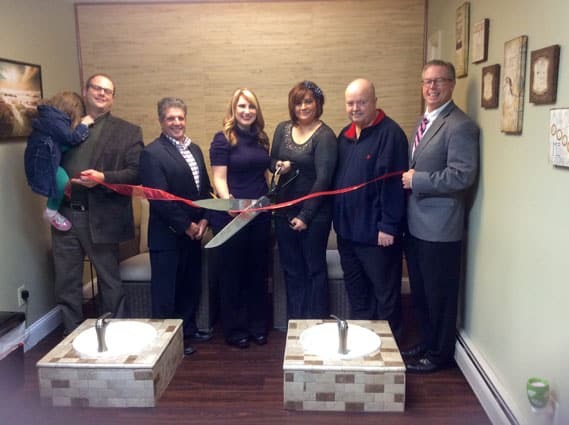 Prime Salon & Day Spa officially opens on Woodstock Ave.
RUTLAND – The ribbon was cut at the Rutland Region Chamber of Commerce Ribbon Cutting and Open House for Prime Salon & Day Spa, Nov. 17, which opened recently at a new location: 164 Woodstock Ave. in Rutland. Ashley Anderson, Co-owner; Maria Donahue, Co-owner; Rep. Tom Terenzini, Vermont House of Representatives; Tom Donahue, EVP/CEO, Rutland Region Chamber of Commerce. For more information about Prime Salon & Day Spa call 802-773-6713 or go to primehairdesign.com.